Prince ruled the charts in the ’80s even when his name wasn’t on the songs. Prince had so many ideas for hit songs that sometimes he just gave them away. Thirty years ago—practically to the day, on a chart dated April 19, 1986—America’s top two singles were a No. 1 song named “Kiss” and a No. 2 called “Manic Monday.” In the pages ofBillboard magazine, on that week’s Hot 100, the chart-topping “Kiss” sported credits of exceptional consistency: artist, producer, and writer were all listed as “Prince and the Revolution.” The No. 2 record, however, had different names in each category. The credited artist was the Bangles, the producer was David Kahne, and—in parentheses and tiny letters—the songwriter’s name ran as “Christopher.” No last name. The cryptic Christopher was, of course, also Prince, handing the Bangles their first-ever pop hit under a pseudonym that wasn’t even a well-kept secret in the spring of ’86. With these two songs alone, the then–27-year-old born Prince Rogers Nelson was defining the breadth of mid-’80s pop. “Kiss,” which that week also topped the dance and R&B charts, is a brazenly minimalist piece of lean funk, sung entirely in a falsetto that cut through the radio like glass. And “Manic Monday,” a warm, DayGlo-colored Mamas and the Papas homage, reupholstered the Bangles’ formerly indie Paisley Undergroundscene into effortless pop. But Prince’s influence that week in 1986 didn’t even end at the top two. At the other end of the chart—No. 99, spending its 23rd and last week on the list after peaking at No. 11 in the winter—was Sheila E.’s percolating synth-funk groove “A Love Bizarre,” a Prince song in all but name. He only took a co-songwriting credit (under his actual name this time), but you hear more Prince than Sheila Escovedo on “Bizarre”: he co-produced it, plays virtually all its instruments, and basically sings it as a duet with Ms. E. (complete with a patented Prince scream toward the end, which a member of Escovedo’s band does a bad job covering with a lip-dub in the music video). Further on up the chart, at No. 12 on its way to a top five peak, was a hit with no direct Prince involvement at all: Janet Jackson’s breakthrough “What Have You Done for Me Lately,” produced and co-written by ex-Time members Jimmy Jam and Terry Lewis. Not only were the Minneapolis production duo, in the early ’80s, given their break and then later fired by Prince, “Lately” is essentially an overt, top-to-bottom recapitulation of the Prince sound: the metronome beat, the staccato synths drizzled like raspberry piping on a dessert, Ms. Jackson’s studiously clipped vocals. It is Prince in post-Motown teen-funk drag (as if Prince didn’t already do his own drag). Years later, poking fun at the obvious homage, Prince even wound up covering the song live. Looking just at this one Hot 100 chart, I could go on: synthed-out, funked-up hits that week from Sly Fox, Jermaine Jackson, Alexander O’Neal, Mr. Mister, and the Jets that owed their shape, their sound, or their very existence to Prince, who Thursday entered the afterworld at age 57. This week in 1986 tells you most of what you need to know about the enormous shadow the Purple One cast over the sound of American popular music in the 1980s and still casts today. Prince wasn’t just a rock/R&B/dance/funk superstar, a pop omnivore, and peerless instrumentalist. The fact is, even when his name wasn’t on a hit, Prince was remaking, hovering over, integrating, and amalgamating the center of American pop during the Top 40’s most genre-blind decade. And he did it with a sonic signature more distinct, even, than that of Michael Jackson, Madonna, or Bruce Springsteen, the pop gods he regarded as his rivals. For all that output, the truth is, for an artist of his Hall of Fame–level stature, Prince’s chart and sales feats under his own name are more modest than they should be. Five Hot 100 No. 1 hits—very respectable but less than half the totals of Michael or Madonna—and not all the songs are his best work. Yes, the immortal “When Doves Cry” was the No. 1 song of 1984, pop’s greatest year, and his next two No. 1s, “Let’s Go Crazy” (also ’84) and the aforementioned “Kiss” (1986) are all-time killers. But “Batdance” (1989) is, at best, an admirably weird curio, and “Cream” (1991) joyous but honestly second-tier. He scored four No. 1 albums, led by 1984’s blockbuster soundtrack to Purple Rain and its 24 weeks atop the album chart, but the other three—Around the World in a Day (1985), the Batman soundtrack (1989), and 3121 (2006)—topped the chart due to timing, marketing, or momentum more than pop preeminence. Moreover, some of His Royal Badness’ hits linger in Americans’ memories more strongly than they performed on the hit parade. “I Wanna Be Your Lover” and “1999” missed the Top 10; “Controversy” fell well short of the Top 40; and the oft-covered “When You Were Mine” went unreleased on 45 and failed to chart at all. During the data-accurate Soundscan era, which began in 1991—and happens to coincide with the period when Prince began feuding with Warner Bros. Records and flitting around to a range of record labels—none of his albums has sold more than a couple of million copies cumulatively: about 3.1 million copies of Purple Rain over the last quarter century (on top of its roughly 10 million in sales during the ’80s), 2.4 million of Diamonds and Pearls, and 1.5 to 2 million each of his various hits collections. All of these stats would seem to position Prince’s pop legacy somewhere in the middle of the megastar pack—alongside, say, Hall and Oates, Phil Collins, or Usher. 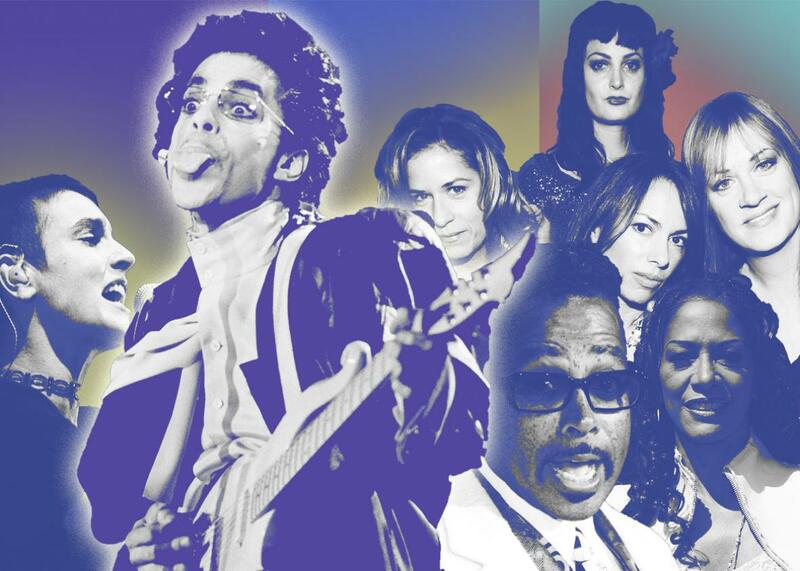 What makes Prince’s footprint larger and more indelible than any of these artists are his simultaneous respect from the rock establishment and embrace by the pop masses, to an extent that none of his peers matched. Among critics, Prince stands alone among artists who emerged after the creation of the rock canon in the late ’70s in terms of ranked canonical albums—at least three, often four Prince albums (Dirty Mind, 1999, Purple Rain, and Sign ‘O’ the Times) routinely make greatest-album lists from the likes of Rolling Stone and Spin. And these acclaimed albums spawned hits that crossed genre lines. The fact is, Prince was way, way ahead of the curve on the 1980s’ genre ecumenicalism and pop omnivorousness. As music critic Michaelangelo Matos notes in his recent retrospective on the classic album Dirty Mind (No. 45, 1980), the young Prince demanded to be signed not to Warner Bros.’ R&B division but its pop division. But it took some years for the industry to get the message—for his first four albums, Prince was marketed harder at black radio, scoring much bigger hits on Hot Soul Singles such as “I Wanna Be Your Lover” (No. 1 R&B, No. 11 pop, 1979) and “Uptown” (No. 5 R&B, No. 101 pop, 1980). Prince’s forward-thinking insistence on marketing himself across genres only really began to pay off when his masterpiece “Little Red Corvette” not only broke into the pop Top 10, beating its black-radio peak (No. 6 pop, No. 15 R&B, 1983) but also made the rock chart Top 20 (No. 17 on Top Tracks, the predecessor to today’s Album or Active Rock chart). Indeed, even amid their rivalry, Prince and Michael Jackson were a two-front superforce busting down the doors at both rock radio and MTV—“Corvette” and “Billie Jean” were shoved into rotation at the video channel virtually simultaneously, and “Corvette” and “Beat It” debuted on the rock chart literally the same week. As if all this appreciation for Prince’s core output weren’t enough, there were the hit sounds and hit songs Prince just gave away. In 1982, he penned and produced Vanity’s minor hit, queer club smash, and raunch classic “Nasty Girl.” In 1983, he performed an uncredited keyboard arrangement on Stevie Nicks’ most enduring solo hit, “Stand Back” (No. 5). Then, in 1984 alone: “The Glamorous Life” for Sheila E. (No. 7), “Jungle Love” for the Time (No. 20), “I Feel for You” for Chaka Khan (No. 3), and even “Sugar Walls” for Sheena Easton (No. 9 in early ’85). Phil Collins openly admitted he pinched the keyboard hook of “1999” for his chart-topper “Sussudio” (No. 1, 1985); Prince generously didn’t sue. In addition to writing “Manic Monday” for the Bangles, Prince’s 1986 smash “Kiss” was taken back to the Top 40 by Tom Jones with the Art of Noise (No. 31, 1989) and to the top of the U.K. indie charts by the Age of Chance (U.K. Indie No. 1, 1986). Prince’s 1990 flop movie/hit album Graffiti Bridge generated its longest-lasting hit not from his own single “Thieves in the Temple” (a No. 6 peak but only a 13-week chart run) but rather from the single he penned for Tevin Campbell, “Round and Round” (a No. 12 peak, a 29-week run). And, perhaps most famously, a deep cut Prince penned for the short-lived Time spinoff band the Family, “Nothing Compares 2 U,” became an improbable, culture-commanding global smash for Sinéad O’Connor (No. 1, 1990). The emergence of hip-hop as America’s leading-edge art form in the ’90s was hard on Prince, finally putting him a step behind. It’s been 22 years since Prince’s last Top 10 single, the post–Warner feud ballad “The Most Beautiful Girl in the World” (No. 3, 1994) and a decade since he made the Hot 100 at all with the hard funk of “Black Sweat” (No. 60, 2006). By then, of course, his influence had been so subsumed by pop as to be part of its lingua franca, underpinning everything from the clattering minimalism of Pharrell Williams and Timbaland to the freaky lasciviousness of Beyoncé and Rihanna. When Prince showed up at the 2013 Grammys to bestow the Record of the Year award upon Gotye’s uber-austere “Somebody That I Used to Know,” and he opened the envelope with the declaration, “Oh, I love this song,” it wasn’t just a signal that Prince was still paying attention. It was a fatherly pat on the shoulder for a hit that made use of the same airiness and space that his own “When Doves Cry” did to became a similarly improbable chart-topper.